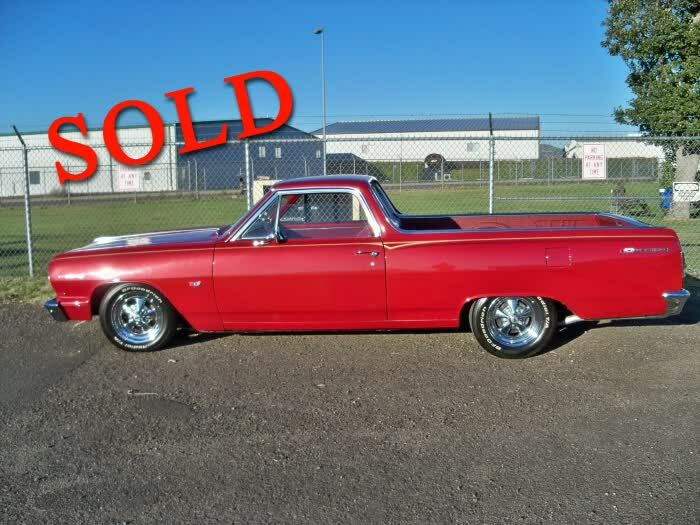 This 1964 Chevrolet El Camino 327 Four Speed has been sold. This was a new-from-the-factory family car. I've done a total frame-off restoration. Everything has been rebuilt or replaced. The original 327 engine has been beefed up and has a Holly 670 4-barrel double pumper carburetor. Only 800 miles on the rebuild. It has an Edelbrock aluminum intake manifold and ceramic coated dual headers. Original transmission is a 4-speed Muncie and has been rebuilt. We installed Firestone Airbags on all 4 corners so it can be lowered to a few inches and lifted for ride height. It has 2 inch drop spindles in front. New power steering box, hi-torque starter, chrome pulleys, and Cragar SS polished 15" Alloy wheels and more upgrades too numerous to mention. We've easily put over $40,000 into it. The car has been professionally appraised by Auto Appraisal Network for $32,500. Appraisal Report is available on request. Feel free to call or email for more pics and info!